Join an amazing group of talented local and traveling guest stars as well as local talent in an evening of vintage fan dance, vintage and neo burlesque and femme fatale danger and beauty! 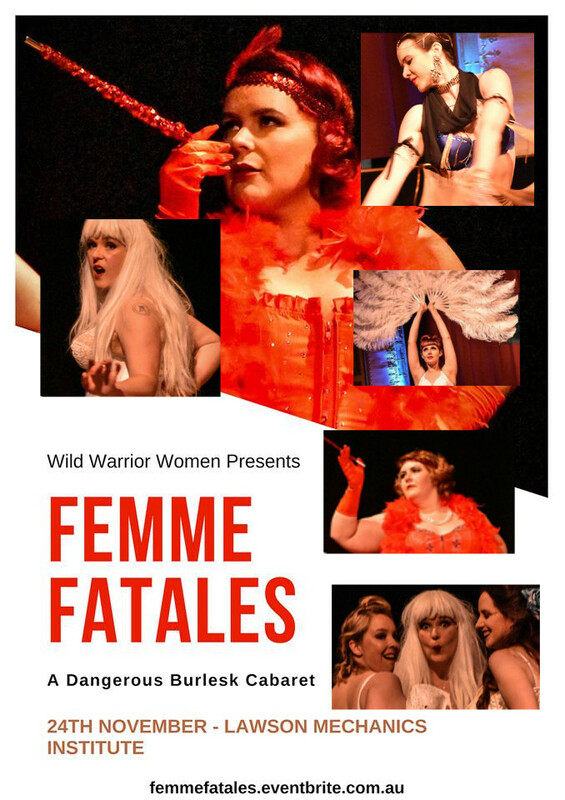 Combining the art of burlesque with acts inspired by the femme fatale this is an event not to be missed! BERLIN VON BLACK (Newcastle) in two stunning acts! QUEENIE LA MER (Blue Mountains) as ‘GILDA’. PORCELAIN (Blue Mountains) (Miss Pinup International 2013 and choreographer for Stone Cold Fox Burlesque Collective and Vintage Vixens Australia. A tribute to CHICAGO the musical! and an extended MAE WEST MEDLEY! V.I.P Seats. Best theatre seats in the house and prime position for audience interaction. B RESERVE – Guaranteed theatre seating. Tickets are strictly limited. We recommend booking early to avoid missing out! Doors Open 7pm. The fun begins at 730pm. This show is run within a feminist framework and as such inappropriate or disrespectful behaviour towards performers will not be tolerated. This is a condition of entry. Note: Water will be provided at the venue along with snacks and non alcoholic beverages available for purchase. Nearby is a Liquor Shop, Hotel, Thai Restaurant, Tapas bar, Kebab Shop, Bakery, Coffee Shop and Fast Food Takeaway.